I just received these amazing Lancome products in the mail and I literally love each and every one!!!! 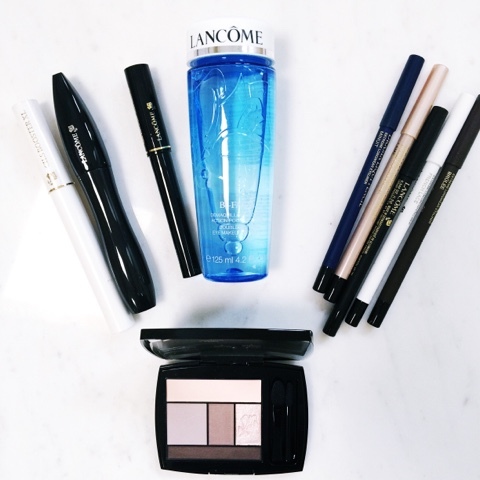 Lancome is just such a classic brand and I think these new eye essentials are a must for your makeup bag. Cils Booster XL is a vitamin-infused innovative mascara primer that gives lashes an XL boost. I think mascara primers are so important to my makeup routine and really soften my lashes. This one is amazing!!! Hypnose Drama is an instant volume mascara with a single coat and no clumps!!! My all time favorite!! Artliner is a precision felt tip liquid liner. It is the number one liner on the market and I'm in love with it!!! Bi-Facil is an award winning makeup remover for all types of makeup, even waterproof. I have been using this for years and it is a must have!!! Drama-Liquid-Pencil is the first liquid liner in a pencil. It provides a 24 hour wear of intense color. I have been waiting for a product like this for forever. Thanks Lancome for creating this (and it comes in a variety of beautiful colors). Color Design Eyeshadow Palette is an all in one 5 shadow palette to brighten eyes. I love the colors and it is perfect to use for day or night. Thanks so much to Lancome for these amazing products. I highly recommend each and every one. Try them out and tell me which ones are your favorites. Happy reading!!! !